Coles in World Chess Champions gives +2-2, Staunton giving Rook odds, but the Chess Player's Chronicle of 1847 gives 5 games and another is given in Mar. 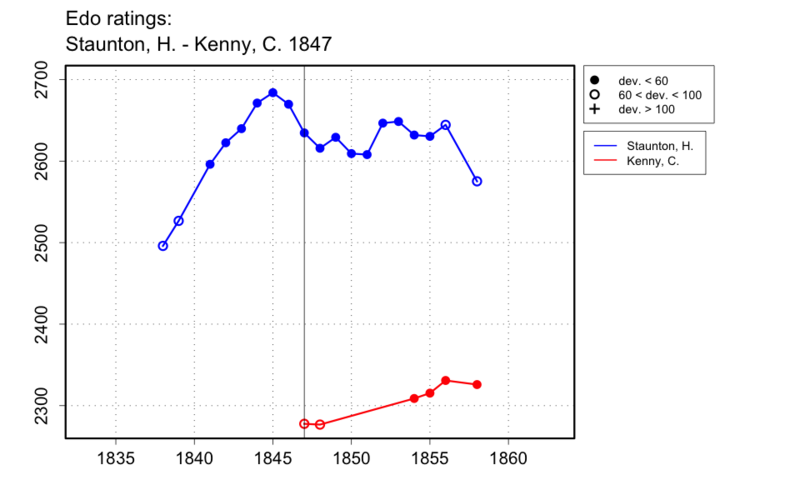 1848, saying it was played 'some months ago', the total of these games being +5-1 for Kenny. Staunton printed another 2 games in the Illustrated London News (21 Aug. 1847, p.123 and 28 Aug. 1847, p.138) bringing the total to +6-2 for Kenny. In the 11 Sept. 1847 issue of the Chess Player's Chronicle, Staunton says that the match is nearly finished, Kenny having won the majority so far. I estimate the dates as Aug.-Sept. 1847 on the basis of these reports, and use the result of the games given.